We Can’t Ignore the Criminalization of Poverty! WORK FOR A HOMELESS BILL OF RIGHTS! Please don’t forget to add wrap@wraphome.org to your Safe Sender/Primary Email list so that we end up in the right inbox! The core of our HBR campaign is based on our outreach to homeless and poor people, in which we document their experiences with local police and private security. We have recently surveyed 1,276 people in five states and twelve cities. The civil rights violation people are experiencing everywhere are eerily similar. The main “illegal offenses” that homeless people are being harassed & criminalized for include: sleeping 81%, sitting or lying down 78%, and loitering or hanging out 66%. We are seeing unprecedented campaigns by local municipalities to enact anti-poor people laws. (Seattle, Portland, Sacramento, Fresno, Albany, Hayward, San Francisco, Palo Alto, Los Angeles, Venice, San Diego, and the list goes on) “Quality of life” ordinances are criminalizing homelessness and preventing people from attaining basic needs such as resting and sleeping. Additionally, with limited resources and funding cuts, poor people have very little support and are faced with numerous barriers which make escaping homelessness impossible. The time has come for a renewed national movement to protect the human and civil rights of poor and homeless people. WRAP is engaged in community organizing, research, public education, advocacy, and direct action efforts to build the power to defeat misguided housing legislation and overturn discriminatory “quality of life” laws. Learn more about our Homeless Bill of Rights Campaign. Do you represent an organization working for social justice and equality? If yes, please endorse our Homeless Bill of Rights Campaign in California and Oregon! Over the past decades, as federal funding for affordable housing nose-dived, the solutions to homelessness have been left to local governments. Though the effort has been far from perfect, almost all Bay Area cities have contributed resources to housing our region’s poorest residents. Many have spent significant city funds. But not Albany. The city of Albany has no homeless shelter. It has next to nothing on providing affordable housing, for years. It has been out of compliance with state law regarding zoning for affordable housing since at least 1999. Oppose the San Francisco Park Closure Proposal! San Francisco Supervisor Scott Wiener has introduced legislation to close all of SF’s public parks from 12 midnight until 5 am. This proposal will be voted on by the Board of Supervisor’s on Tuesday October 29th @ 1 pm. Further eliminate already diminishing access to public space for ALL. Please make a donation to WRAP and help sustain our efforts to make ending homelessness a national priority! Editor’s Note: Continuing our coverage of rights-based movements and narratives. Simon Davis-Cohen speaks with Paul Boden about Homeless Bills of Rights. Paul Boden is Western Regional Advocacy Project ‘s Organizing Director. He became homeless at the age of 16 after the death of his mother. Paul served as Executive Director of San Francisco’s Coalition on Homelessness for 16 years and was a founder of the Community Housing Partnership, a nationally recognized permanent housing corporation with optional supportive services. He has received dozens of community awards during the last twenty-five years and recognition from the city and county of San Francisco, the State of California, and the Congress of the United States. Paul regularly writes articles and op-eds and travels throughout the country giving talks and trainings. Connect with our members’ campaign in Oregon! Join their lists and endorse their Bill. Pass a Homeless Bill of Rights in the state of Oregon (introduce the Homeless Bill of Rights into the Oregon State Legislature in 2014). In our August cover story, author Paula Lomazzi argued that we shouldn’t enact laws and policies that effectively make it a crime to be homeless. Lomazzi, formerly homeless herself and now the director of the Sacramento Homeless Organizing Committee, made a compelling argument in favor or community, compassion, and practical solutions to ending homelessness. Our readers agreed, with 67 percent indicating that they would vote against legislation that prohibited sleeping outside in their city. The Los Angeles City Council is considering new regulations that could potentially shut down a food truck that has been feeding the hungry on the streets of Hollywood for more than 25 years. The Public Works Committee heard a motion introduced by Councilman Tom LaBonge Wednesday, which urges city departments to consider banning non-commercial food distribution in public rights of way, an initiative that would force the Greater West Hollywood Food Coalition to move. We are sustained through individual donations and generous foundations. We need your support to continue our work and help us stand up for poor and homeless peoples’ civil rights! WRAP is a 501(c)3 organization. The United States has a long history of using mean-spirited and often brutal laws to keep “certain” people out of public spaces and out of public consciousness. Jim Crow laws segregated the South after the Civil War and Sundown Towns forced people to leave town before the sun set. The anti-Okie law of 1930s California forbade poor Dustbowl immigrants from entering the state and Ugly Laws (on the books in Chicago until the 1970s) swept the country and criminalized people with disabilities for allowing themselves to be seen in public. 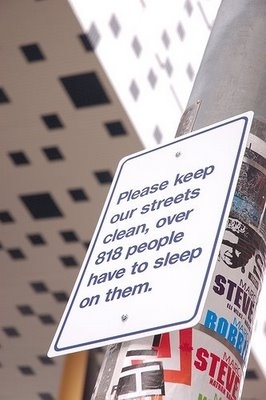 Today, such laws target mostly homeless people and are commonly called “quality of life” or “nuisance crimes.” They criminalize sleeping, standing, sitting, and even food-sharing. Just like the laws from our past, they deny people their right to exist in local communities. In June of this year, Rhode Island took a meaningful stand against this criminalization, and passed the first statewide Homeless Bill of Rights in the country. The Western Regional Advocacy Project (WRAP)—a West Coast grassroots network of homeless people’s organizations—is now launching simultaneous campaigns in California and Oregon. Rhode Island will only be the beginning. Today’s “quality of life” laws and ordinances have their roots in the broken-windows theory. This theory holds that one poor person in a neighborhood is like a first unrepaired broken window and if the “window” is not immediately fixed or removed, it is a signal that no one cares, disorder will flourish, and the community will go to hell in a handbasket. For this theory to make sense, you first have to step away from thinking of people, or at least poor people, as human beings. You need to objectify them. You need to see them as dusty broken windows in a vacant building. That is why we now have Business Improvement Districts (BIDs) with police enforcement to keep that neighborhood flourishing by keeping poor, unsightly people out of it. Unless we organize, it isn’t going to get much better soon. Since 1982, the federal government has cut up to $52 billion a year from affordable housing and pushed hundreds of thousands of people into the shelter system or into the street. Today we continue to have three million people a year without homes. 1982 also marked the beginning of homelessness as a “crime wave” that would consume the efforts of local and state police forces over the next three decades. Millions of people across the country sitting, lying down, hanging out, and — perhaps worst of all – sleeping are cited in crime statistics. WRAP and our allies recently conducted outreach to over 700 homeless people in 13 cities; we found 77% of people had been arrested, cited, or harassed for sleeping, 75% for loitering, and 73% for sitting on a sidewalk. We are right back to Jim Crow Laws, Sundown Towns, Ugly Laws and Anti-Okie Laws, local laws that profess to “uphold the locally accepted obligations of civility.” Such laws have always been used by people in power against those on the outside. In other words, today’s Business Improvement Districts and Broken Window Laws are, at their core, a reincarnation of various phases of American history none of us is proud of. And they reflect a political voice now openly entering the political and media mainstream that dismisses social justice as economically irrelevant and poor people as humanly irrelevant. This is not about caring for or even advocating for “those people.” This is about all of us. As Aboriginal leader Lilla Watson said, “If you have come here to help me, you are wasting your time. But if you have come because your liberation is bound up with mine, then let us work together.” If you are not homeless, if you are not the target now, then understand that you are next. Isolated and fragmented, we lose this fight. But we are no longer isolated and fragmented. On April 1, WRAP and USCAI (US Canadian Alliance of Inhabitants) sponsored a Day of Action in 17 cities. We are one of hundreds of organizations and allies, from Massachusetts to NewYork and from Tennessee to California, all separate but all working together to give meaning to social justice and protect the civil and human rights of all of us. We can only win this struggle if we use our collective strengths, organizing, outreach, research, public education, artwork, and direct actions. We are continuing to expand our network of organizations and cities and we will ultimately bring down the whole oppressive system of policing poverty and treating poor people as “broken windows” to be discarded and replaced. To join our campaign for a Homeless Bill of Rights in both California and Oregon contact WRAP at wrap@wraphome.org and we will hook you up with organizers working in both of these states or others as this movement continues to grow. When a city like Ashland, Oregon passes laws targeting the homeless it sends a clear message that they are not welcome. It sends another message that beneath the thin veneer; society considers them worthless. Instead of lending a helping hand, most people cross to the other side of the street to avoid them. As if they have something that is contagious. This lack of empathy I find to be heartbreaking. McCain’s home state of Arizona is one of the places where 32 homeless people died on the streets of Phoenix, in the summer of 2005. Four homeless men died of heat exposure, in one weekend, in the summer of 2006. Sad statistics that I’m sure did not even get a mention in the local paper. When cities like Phoenix and Ashland could solve the problem easily by building homeless shelters. The ACLU of Oregon is challenging Ashland’s anti-camping ordinance. The Southern Oregon Chapter of the American Civil Liberties Union of Oregon calls upon the City of Ashland to amend its “Prohibited Camping” ordinance from one that punishes poverty and homelessness into one that prods the city to provide housing for the homeless. The city’s inhumane anti-camping law is inconsistent with the values of the Ashland, and the ACLU calls for immediate reform. Section 10.46.020 (“Camping Prohibited”) should be amended to provide that, except as set forth in Section 10.46.030, the prohibitions in this ordinance shall not apply between the hours of 9 p.m. and 8 a.m., unless and until at least 50 units of permanent supportive housing are created within the City of Ashland, at least 50 percent of which are centrally located. These units must be created for current or chronically homeless persons. Section 10.46.050 (“Penalties”) should be amended to lower the offense in Subsection A to a “violation,” to correct the erroneous reference in Subsection B to Section 1.08.010, and to correct the next to last word in Subsection B from “rebuttal” to “rebuttable. Section 10.68.230 (“Sleeping Prohibited”) should be repealed. The “Sleeping Prohibited” is way over the top. Ashland is by far not the worse for their poor treatment of the homeless; actually that goes to Florida. Florida historically is “one of the worst states for criminalizing homelessness.” Stoops points out an Orlando ordinance that limits feeding homeless people in public places. In April 2007, undercover cops were sent to Orlando’s Lake Eola Park, to arrest Eric Montanez for feeding 30 homeless people – five more than the city’s 25-person limit. “You can feed pigeons, dogs and squirrels, but God forbid you try to feed the homeless,” Stoops says. In many cases, ours laws protect animals better than they do people. It makes me yearn for the stories my grandmother use to tell me about – during the depression – when her family of 11, use to feed the homeless that would come to their back door for a meal. They didn’t have any money but they never turned away a single person that came to the door hungry. It was the worst of times that brought out the best in people. Check out this new blog from folks in Oregon. Right 2 Survive = r2s = a collection of homeless people, formerly homeless, and their allies. We are determined to assert and strengthen the human rights to survive, to shelter, to safety, and to self-support.